This example shows how to recognize and track multiple images simultaneously. Furthermore it shows how to use distance, translation and rotation between the tracked images. For a better understanding it is recommended to read the documentation of Image Recognition and 3D Models first. Please use the following image on this page to test the sample. 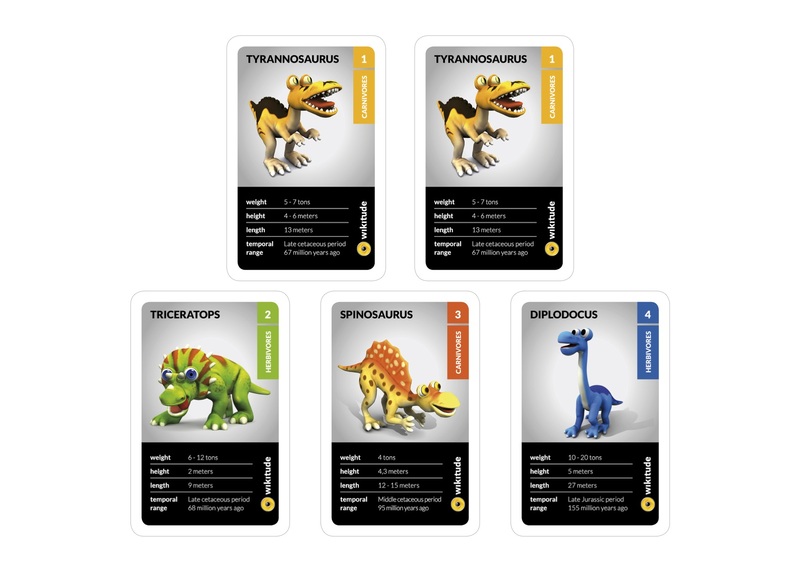 It is recommended to print the image and cut out the different cards to see the interaction between the dinosaurs. // To enable simultaneous tracking of multiple targets 'maximumNumberOfConcurrentlyTrackableTargets' has to be set. maximumNumberOfConcurrentlyTrackableTargets: 5, // A maximum of five images can be concurrently tracked. //Disables extended range recognition. The reason for this is that extended range recognition requires more processing power and with multiple targets the SDK is trying to recognize targets until the maximumNumberOfConcurrentlyTrackableTargets is reached and it may slow down the tracking of already recognized targets. To add Drawables to specific ImageTargets, ImageTrackable.addImageTargetCamDrawables can be used. // Adds the model as augmentation for the currently recognized target. This example shows how to use the distance between targets. ImageTarget.getDistanceTo which returns the distance from this ImageTarget to the passed ImageTarget. ImageTarget.onDistanceChanged gets triggered whenever the distance from this ImageTarget to any other currently tracked ImageTarget changed by more than the threshold. The threshold is specified in the options of the ImageTracker(onDistanceChangedThreshold). The parameters contain the distance and the ImageTarget to which this distance was measured. onDistanceChangedThreshold: 10 // By setting this to 10, the distance between two targets has to change by 10mm before ImageTarget.onDistanceChanged is triggered again. // Trigger callback whenever the distance between the currently recognized target and another target change by more than the threshold defined in the AR.ImageTracker. This example shows the transformations between targets. This functionality includes the translation and rotation between targets. ImageTarget.getTranslationTo returns the translation from this ImageTarget to the passed ImageTarget. ImageTarget.onTranslationChanged gets triggered whenever the translation from this ImageTarget to any other currently tracked ImageTarget changed by more than the threshold specified in the options of the ImageTracker(onTranslationChangedThreshold). The parameters contain the translation and the ImageTarget to which this Translation was measured. ImageTarget.getRotationTo returns the rotation from this ImageTarget to the passed ImageTarget. ImageTarget.onRotationChanged gets triggered whenever the rotation from this ImageTarget to any other currently tracked ImageTarget changed by more than the threshold specified in the options of the ImageTracker(onRotationChangedThreshold). The parameters contain the rotation and the ImageTarget to which this rotation was measured. Note: The translation and rotation are based on the coordinate system of the ImageTarget whose onTranslation/-RotationChanged callback is triggered or whose getTranslation/-Rotation is called. This means the translation from imageTarget1 to imageTarget2 may be different than the one from imageTarget2 to imageTarget1. onRotationThreshold: 10 // By setting this to 10, the distance between two targets has to change by 10mm before ImageTarget.onDistanceChanged is triggered again. // If dinosaurs are facing each other and are within 150mm one should attack.